JEFFERSON’S RULES: Browsing through the Thomas Jefferson Foundation’s excellent on-line Thomas Jefferson Encyclopedia, I came across something I hadn’t seen before, Thomas Jefferson’s “Canons of Conduct,” a list of axioms for personal behavior. 9. How much pain have cost us the evils which have never happen’d! It’s interesting to note that Thomas Jefferson himself conspicuously did not follow at least two of the Canon items: spending money before you have it and watching his pennies. As I noted in Saving Monticello, Jefferson loved spending money (that he had—and that he did not have) and wound up over $107,000 in debt when he died. That financial burden forced his family (led by his daughter Martha Jefferson Randolph and grandson Thomas Jefferson Randolph) to sell all of the land they inherited, as well as the furniture and furnishings at Monticello—and then, in 1831, Monticello itself. EVENTS: I have just two events in December, as I am now in full-time writing mode on my next book, a biography of Barry Sadler, the U.S. Army Sergeant who wrote and performed “The Ballad of the Green Berets.” The pub date is November of 2016. Tuesday, December 1 – book signing (of all of my books) at the Williamsburg, Virginia DAR Chapter’s annual Holiday Bazaar event at Colonial Country Club. Thursday, December 10 – a talk on Saving Monticello for the Hanukkah Program at the Pentagon Chapel in Washington, D.C.
URIAH LEVY’S GIFT: I recently came across an excellent on-line article on the history of the statue of Thomas Jefferson that Uriah Levy commissioned in 1833 that today is the only privately donated statue in Statuary Hall in the Rontuda of the U.S. Capitol. The article, by Linda Tederick, Assistant Curator at The White House, has great images and uses Saving Monticello as one of its main sources.It tells the entire story of how Uriah Levy commissioned the statue (from the famed French sculptor Pierre-Jean David d'Angers in Paris in the fall of 1832) and how it wound up in the Capitol—focusing, naturally, on the time that it was displayed on the White House lawn. As I noted in the book Levy was in Paris taking time off from his U.S. Navy duties. He paid a visit to the 75-year-old Marquis de Lafayette, who had been a close friend of Jefferson’s since they met in Richmond during the Revolutionary War. Lafayette, who died in 1834, loaned Levy a portrait of Jefferson by the American painter Thomas Sully, which David used as his model for Jefferson's face. Levy stayed in Paris until David completed the statue early in 1834. 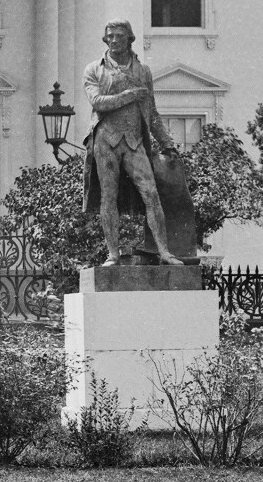 It stands seven-and-a-half feet tall and depicts Jefferson holding a quill pen in his right hand. In his left is an etched, word-for-word copy of the Declaration of Independence, complete with signatures, including the large “John Hancock.” Behind him are two large books, topped with a laurel wreath. The statue was cast in bronze, and Levy shipped both the finished statue and the plaster mold used to cast it to the United States. On February 6, 1834, he presented the painted plaster model to the City of New York. The statue was placed on the second floor of the Rotunda at City Hall. It was moved into the ornate City Council Chamber in the 1950s where today it is the only piece of sculpture in a room filled with oil portraits. 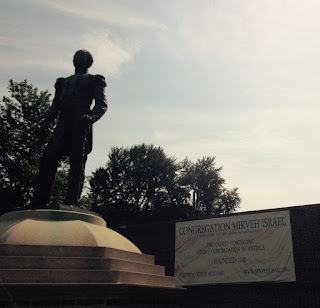 A month after he gave the model to New York City, Uriah Levy presented the bronze Jefferson to the nation. 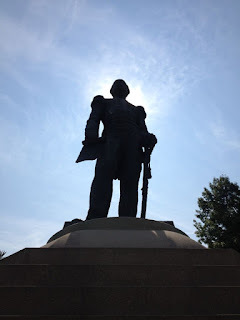 He had the words “Presented by Uriah Phillips Levy of the United States Navy to his fellow citizens, 1833,” etched on one side of the statue's bronze base. It was displayed inside the Capitol, in the Rotunda. Sometime during the James K. Polk administration (1845-1949) the statue was removed from the Rotunda. It was shipped up Pennsylvania Avenue to the White House where, with the permission of President Polk, it was placed on the grounds on the north side facing Lafayette Park. The photo above was taken around in the 1860s. It remained there until 1874 when the statue was cleaned up (it had suffered badly from exposure to the elements) and moved into National Statuary Hall in the Capitol Rotunda, where it stands today. TEEN-AGED MARTHA: A new cache of letters, including a group of previously private missives written by Martha Jefferson Randolph, Thomas Jefferson’s oldest daughter who lived at Monticello with her eleven children and inherited the place after her father died in 1826. The letters were written when Martha she was in Paris while her father was U.S. Minister to France (1784-89). They recently have been leant to the Thomas Jefferson Foundation—the folks who own and operate Monticello—by a group of Jefferson descendants. Other documents in this collection were compiled by Martha Randolph’s granddaughter Martha Jefferson Trist Burke. They include descriptions and reminiscences about the cabin of John and Priscilla Hemmings, who were enslaved at Monticello. That material has helped Foundation’s Curatorial Department interpret and present that space. Saturday, November 14 – A talk on Saving Monticello for the Providence DAR Chapter in Fairfax City, Virginia. Thursday, November 19 – A talk and book signing at the Glen Allen Branch Library, 10501 Staples Mill Rd., Glen Allen, Va. on Lafayette. The event is free and open to the public. For info, call 804-290-9500. Saturday, November 21 – A talk on Lafayette and book signing for the Colonel William Grayson SAR Chapter in Haymarket, Virginia. 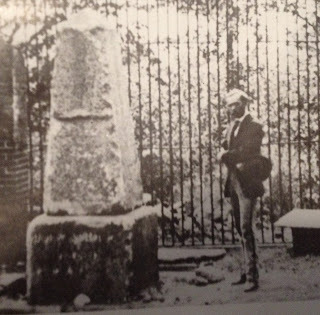 Since I knew that over the years visitors had taken souvenir chippings off Jefferson’s gravestone, and that the stone was replaced by Congress in the 1880s—and given the wording on the photo—the caption I came up with for the book reads: “George Wythe Randolph, Thomas Jefferson’s youngest grandchild, at the Jefferson gravesite at Monticello circa 1871” along with two more sentences (I like to use long photo captions in my books) explaining the tourist chippings and Congress’s 1882 appropriation of $10,000 for a new monument. Well, it turns out that a mistake was made. The man in the photo most certainly isn’t George Wythe Randolph (in photo below—and yes, that’s him), as he died of tuberculosis in 1867. 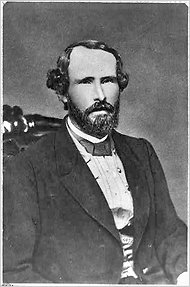 Randolph, a lawyer and Confederate Army general, served as the South’s Secretary of War from March 1862 until November of that year when he resigned for health reasons. 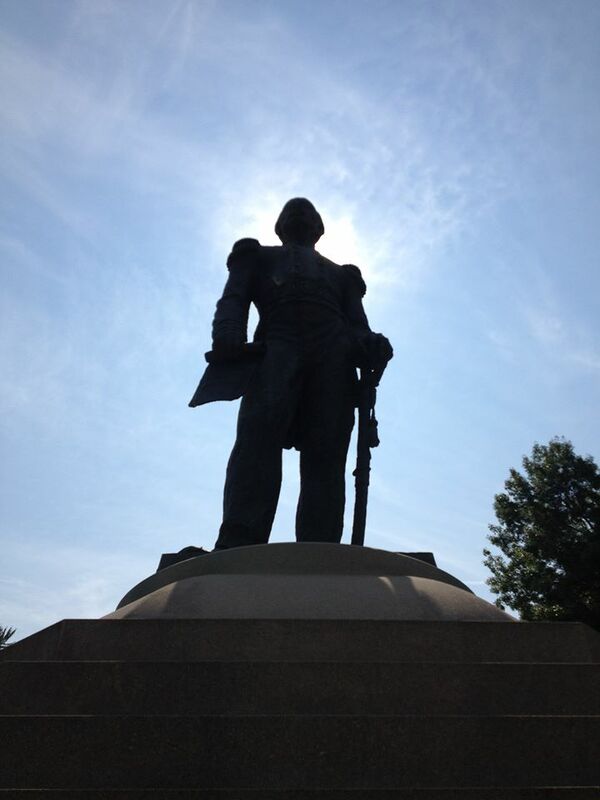 A quick check of the U-Va. Special Collections web site found that the photo, which is described as “Mr. 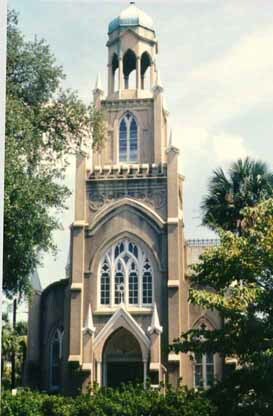 Randolph’s graveyard,” is actually of George Randolph’s grave. Bill Burgan, an SM Newsletter subscriber, a Facebook friend of mine—and, more importantly, a long-time guide at Monticello—pointed that out to me after he received the newsletter. 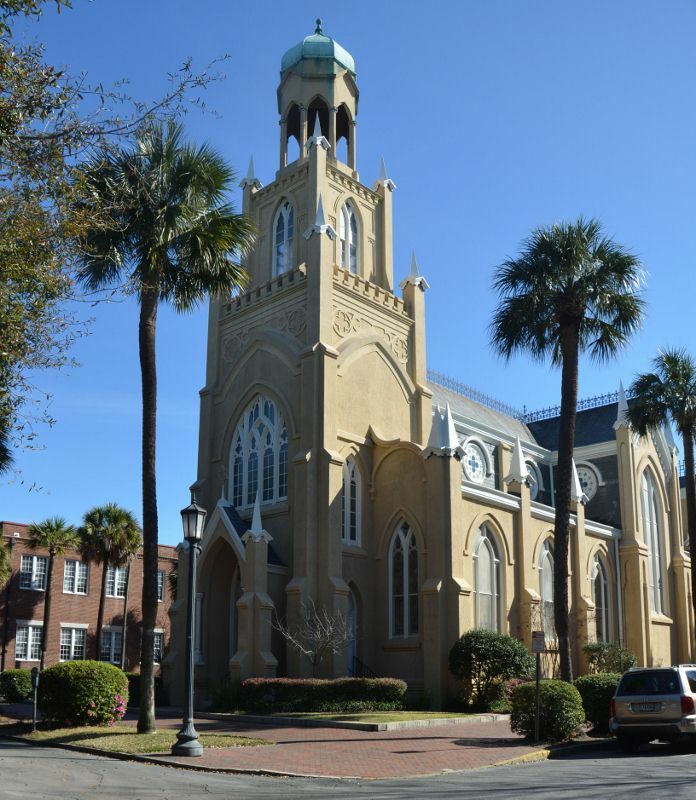 THE LEVY CHAPEL: It seems (almost) like yesterday that the U.S. 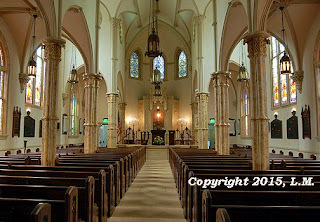 Naval Academy dedicated the Commodore Uriah P. Levy Center and Chapel adjacent to Bancroft Hall on the Academy’s grounds. I was fortunate enough to attend the ribbon-cutting ten years ago, on September 18, 2005, for the dedication, along with several hundred other guests. 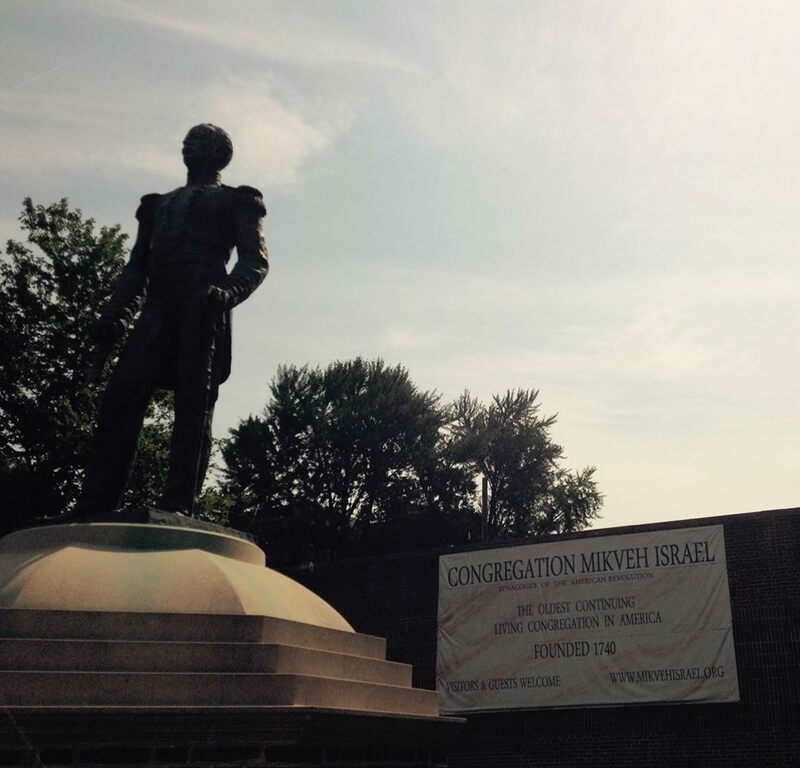 It was a great occasion, marking the opening of the first Jewish Chapel at the Naval Academy. It is housed in an impressive building designed with a dome on the main entrance in recognitions of Uriah Levy’s ownership of Monticello. 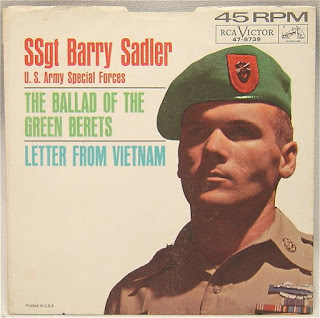 EVENTS: I only have one event in October as I have begun the full-time writing phase of my next book, a biography of Barry Sadler, the U.S. Army Sergeant who wrote and performed “The Ballad of the Green Berets.” The pub date is November of 2016. The photo of Sadler at left was taken in Guatemala in the mid-eighties. Sadler moved there in 1983 to write books and take part in other activities involving weapons, such as the AK 47 he’s holding in this picture a friend of his loaned to me to use in the book. 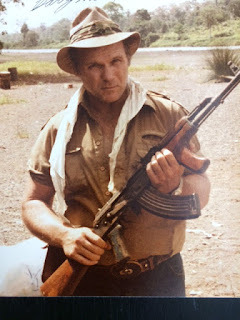 Barry Sadler died in November of 1989, a little more than a year after he took a bullet to the head in a taxi cab in Guatemala City. There are several theories about exactly what happened in that taxi cab. Stay tuned. My one event this month will take place on Monday, October 12, a talk on the Marquis de Lafayette for the local chapter of the Colonial Dames of the XVIIth Century at the historic Purcellville Train Station in P-ville, Virginia, not far from where I live in Loudoun County, Va.
UPSTAIRS, DOWNSTAIRS: When I was doing the research for Saving Monticello in 1999 and 2000, I had several meetings with Susan Stein, the renowned curator on Jefferson’s Mountain. We met in her small office located upstairs on the second floor of Thomas Jefferson’s Essay in Architecture. The rest of the rooms up there—bedrooms in Thomas Jefferson’s day—remained empty and unvisited as the second floor (including the Dome Room) was closed to the public. The rooms upstairs remained all but empty for years after Susan moved her office elsewhere on the property. But several years ago, the Thomas Jefferson Foundation began restoring several of the upstairs rooms and offering special tours. Then, on May 2, the Foundation announced what’s being called a “milestone” in their mission to restore Monticello to what the place looked like when Thomas Jefferson lived there. Called “The Mountaintop Project,” the milestone consists of the full restoration and furnishing of nine upstairs rooms. Those are the bedrooms where Thomas Jefferson’s grown daughter Martha Randolph and her eleven children lived after Jefferson’s wife (also Martha) had died and his daughter Martha—known as Patsy as a child—brought her family to her childhood home to live. “It’s the first time in ninety-two years we’ve seen the upstairs rooms fully furnished,” said Leslie Greene Bowman, the Foundation’s president and CEO. Those newly restored and furnished bedrooms are where Patsy and her children moved when her father retired from the presidency in 1809 and came back to Monticello to live there full time. Martha and the children were living there when she was forced to sell Monticello in 1831, five years after Thomas Jefferson’s death, to try to pay off the debts she inherited from her father—a story I tell in detail in Saving Monticello. The Mountaintop Project also includes the recreation of two log cabins along Mulberry Row (where Uriah Levy’s mother Rachel is buried) where John and Priscilla Hemings, an enslaved couple, lived, as well as a workshop. This “allows us to tell the stories of the family, servants, and slaves who lived and worked in those rooms and gives a fuller picture of what life at Monticello was really like,” Leslie Bowman said. The main benefactor of the Mountaintop Project, David M. Rubenstein, the co-founder of the Carlyle Group, made a big announcement at a dinner on May at Monticello: that he was donating $10 million to Monticello, matching the amount he gave the Foundation in 2013. 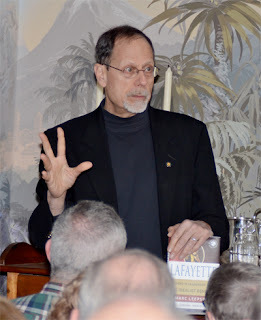 EVENTS: Here’s a rundown on my June events, two of which deal with my book, Lafayette: Idealist General, in conjunction with the visit in June of the replica ship L’Hermione, which Lafayette sailed on his second trip to the U.S. in 1780. 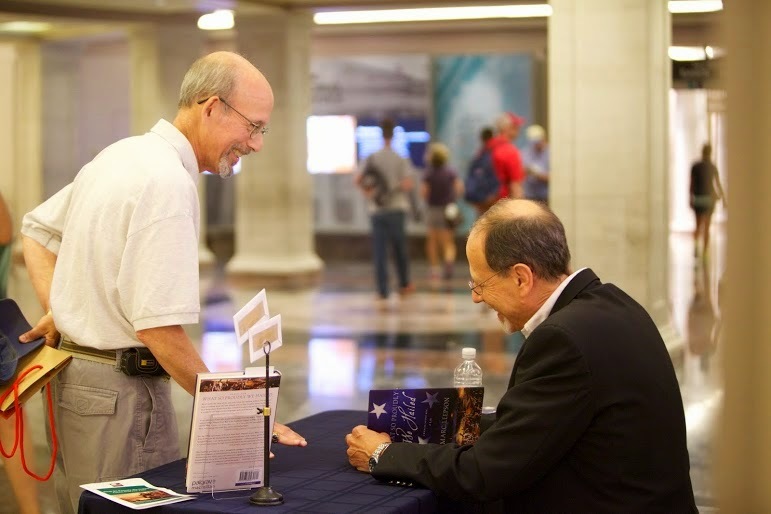 ON JEFFERSON LEVY: In my ongoing quest to discover all there is to know about the Levy family that didn’t make it into Saving Monticello, I recently came across two items dealing with Jefferson Levy that shed light on his character and personality. 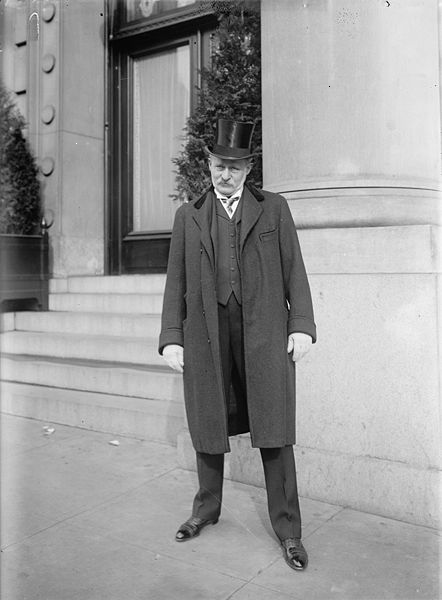 The first is a newspaper account that contains his strong reaction to the momentous December 10, 1912, vote in the House of Representatives. That’s the one that defeated a resolution that would have condemned Monticello, taken in from Levy, and made into a government-run shrine to Thomas Jefferson. As I noted in the book, the bill went down 141-101. Jefferson Levy was a member of the House at the time. Naturally, he voted against the bill that would have taken Monticello from him. And why not—he had owned Monticello since 1879 and had spent hundreds of thousands of dollars repairing, restoring, preserving and furnishing Jefferson’s Essay in Architecture. I left the rest of the quote out of the book. But when I recently re-read it, I was intrigued by what he said. Here’s the entire quote, in which Jefferson Levy addresses the baseless charges that he wouldn’t let members of the public onto the grounds of Monticello and that he made things difficult for Jefferson descendants when they wanted to visit the family cemetery on the grounds of Monticello. “I am deeply grateful to the American people for their thoughtful consideration during this trying ordeal, when it has been sought to take from me against my will property which I love both because of its association with that great statesman, Thomas Jefferson, and because to me it answers to the name of home, which all that word signifies to anyone. A little deconstruction of that statement is in order. First, using the phrase “trying ordeal” confirms what I’ve gleaned elsewhere that the stern and driven businessman was deeply hurt by the effort to take Monticello from him. Second, I strongly doubt that that “the American people” provided significant “consideration” to Levy during that year as the campaign to take Monticello from him reached the halls of Congress. Levy did have support on Capitol Hill (as evidenced by the vote), but I didn’t find much, if any, outpouring for him from “the American people” to keep Monticello as his private home. Speaking of his “home,” Monticello was not it. 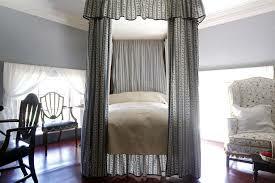 Jefferson Levy used the place as his vacation getaway, visiting regularly, but his true home was in New York City. Still, as Levy had owned and lived in Monticello (at times) for thirty-three years, it is very possible that he considered it at least one of his homes. Lastly, it also is true that Jefferson Levy did allow visitors (bidden and unbidden) to visit the grounds at Monticello. However, at one time he did charge a nominal fee, much as was the case at Mount Vernon. 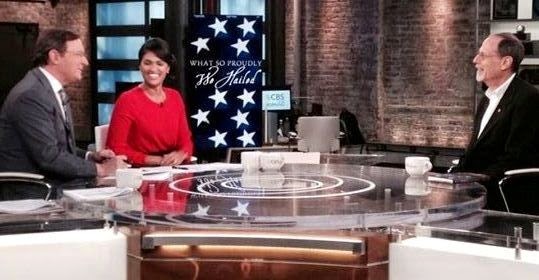 Wilson, for one thing, “was feeling much better,” according to his family physician, Dr. Cary Grayson, the article noted. That generous offer from one Democratic politician to another was turned down. EVENTS: Here’s a rundown on my April events.